As more employers struggle to find qualified workers, they also tend to require higher levels of education to best match the skill sets they need. The Department of Labor carefully tracks employment and the levels of education associated with various positions. As expected, individuals that have attained a higher level of education tend to have better chances of being employed. 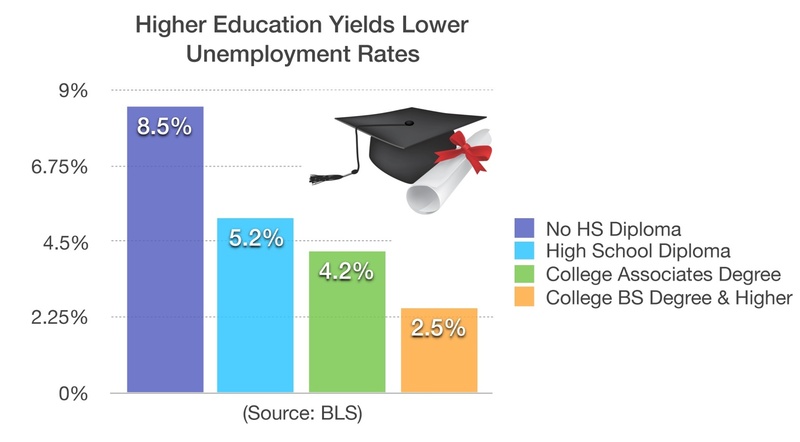 The most recent data from the Department of Labor shows that individuals that haven’t attained a high school diploma have a 8.5% unemployment rate, while those with a college BS Degree or higher yield a 2.5% unemployment rate.